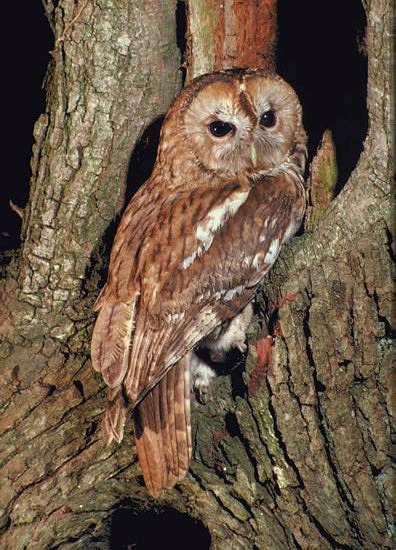 Tawny Owls are plentiful in Britain and Ireland, and they are more a bird of woodland than of farm buildings. These nocturnal birds are responsible for the 'tu-whit... tu-whoo' calls that echo through the wooded valleys after dark. The baby owls, called owlets, are grey downy little creatures with big round faces and dark eyes like those of their parents. 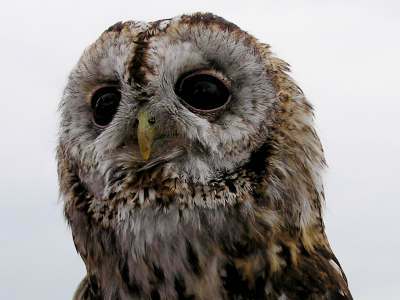 Some adults retain a slight greyish tinge; however, the majority of Tawny Owls are a rich chestnut brown with buff mottling; not only are they darker but, with a length of typically 40cm and a wingspan of about a metre, they are also rather larger than Barn Owls and considerably more plentiful in Britain. Tawny Owls are good hunters and they are able to kill mice, rats and even small rabbits - but more than anything, it seems, they love to eat worms! Normally these owls will lay three or four eggs in a nest, most often in a hole in a tree. They are also known to make use of the nests of crows or other large birds and even squirrel dreys.